I just finished my first 10-day cleanse and feel fine. My 26-year-old daughter, however has lead poisoning, multiple chemical sensitivities, an infection of the thyroid and low blood sugar. She started the cleanse today. She did not put cayenne in her first drink, so she doubled it in her next drink. She felt bad immediately and had a very bad reaction. She tested allergic to cayenne about 18 months ago, but we thought it had gone away. Is there an alternative for the cayenne pepper or do you have any suggestions? I was sorry to hear about her daughter's reactions. Although I am not a licensed health care practitioner and therefore cannot diagnose, prescribe, cure or treat any disease, I did offer her information on what I know has happened with others in similar situations and what they did. Second, detoxification is not a single action—first the toxins are here and then they're gone. No. Detoxification is a two step process—first they are mobilized from where the body has stored them to protect itself. Then they are neutralized and eliminated through the liver, colon, kidneys, skin, and lungs. If a person brings toxins out of storage faster than the body can neutralize and eliminate them, she/he will get a detox symptom or reaction because the toxins can be reabsorbed before they are eliminated. The Master Cleanse is perhaps the second fastest method of detoxification. (A pure water fast is the fastest.) However, "fast" isn't always best for the above reason that it may be more than the body can handle. People with poor elimination or people with too many toxins need a slower method so their elimination system can keep up. I talk about people who should take it easy on the Master Cleanse in Lose Weight, Have More Energy & Be Happier in 10 Days. I also say on our Master Cleanse Bulletin Board that people undergoing chemotherapy or with several-year histories of taking strong medical drugs should not do the Master Cleanse without doing slower types of detoxification first. They have too many toxins to try to detoxify quickly. It may cause too many seriously unpleasant reactions and, in the case of those on or just off chemotherapy, possibly even cause harm. One of the things cayenne does is dilate blood vessels and dissolve mucus. It acts like an accelerator pedal for the Master Cleanse. So, it's possible her daughter "double-whammied" herself when she did a Master Cleanse lemonade with double the amount of the cayenne. Here is my scale of detoxifying actions ranked from fastest (1) to slowest (10). I recommended she choose one of these slower methods. Predominantly raw vegan diet with the rest of the diet being cooked vegetarian food. 100% vegetarian diet without sugar or artificially preserved, colored, flavored, sweetened, or prepared foods. Drinking at least a pint of freshly made green smoothie every day. or email it to friends. 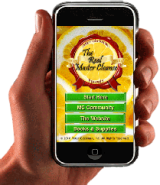 Convenient & accurate Master Cleanse information on your iPhone! Get all the info you need to do the Master Cleanse - Instantly! My purpose is to educate you on low- and no-cost ways others have achieved and maintained vibrant good health. Because everyone's body is different, you must learn what will work for you. Like anything else, if you want it done right, you have to do it yourself. Federal Trade Commission guidelines for testimonials in advertising require that typical results must be clearly stated. Typical Master Cleanse results are weight loss. (Ten days on a 660 - 1320 calorie per day diet will do that.) Results vary. The statements and testimonials on this website have not been evaluated by any government agency and are not intended to medically diagnose, treat, cure or prevent any disease. Cleanse recipes are recommended based upon traditional wellness beliefs. Food, nutritional or other products are not offered to diagnose or prescribe for medical or psychological conditions nor to claim to prevent, treat, mitigate or cure such conditions, nor to recommend specific nutritional products as treatment of disease or to provide diagnosis, care, treatment or rehabilitation of individuals, or apply medical, mental health or human development principles, to provide diagnosing, treating, operating or prescribing for any human disease, pain, injury, deformity or physical condition. The information on this site is not a substitute for medical advice from your primary care physician. The advice and products that may be recommended are offered as therapies that may benefit normal structure and function only.